Zoomcar India Pvt Ltd has reported total revenues of INR 121 crore in its latest financial statement for the FY 16-17. The passenger transport service provider offers customers self-driving vehicles on rent. The company also runs the Zoomcar Associate Program (ZAP) for leasing of motor vehicles. 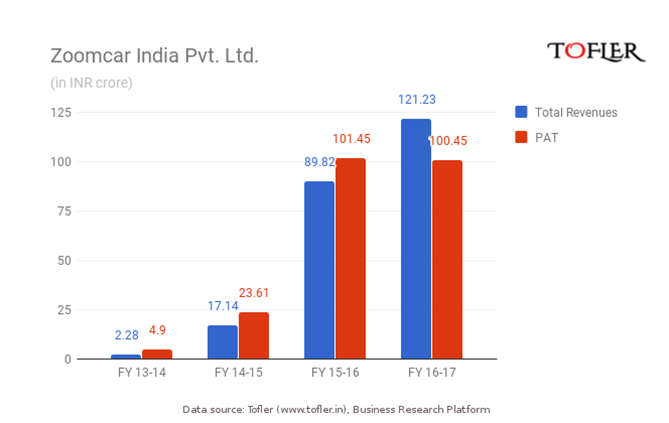 Financial Performance of Zoomcar India Pvt. Ltd. The latest balance sheet released by Zoomcar reveals a revenue of INR 121 crore, which is a 35 percent jump over the previous fiscal year’s INR 90 crore. The profit and loss account reported a loss of INR 100 crore in the same period, though there has not been any significant movement in this metric since the previous year. Most of Zoomcar’s revenue comes from renting out self drive cars. 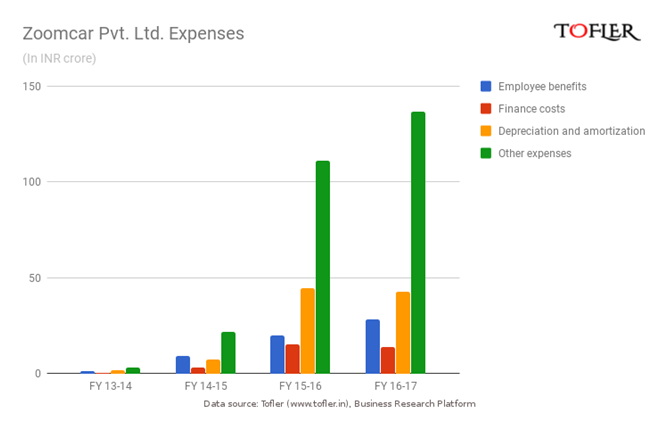 Zoomcar’s total expenses for FY 16-17 were reported to be INR 222 crore, which has grown nearly five times since expenses reported for FY 14-15. Expenses are split between employee benefits, depreciation of its assets including motor vehicles, which have a useful life of three years and other expenses. Zoomcar India is a Bengaluru-based subsidiary of Zoomcar Inc, and it is the pioneer of self-driven cars in the country. It first launched operations in Bangalore in 2013, with a fleet of seven cars. Since then, the company has grown its fleet to more than 3000 vehicles, and offers its services across seventeen cities across the country, including Delhi, Bangalore, Mumbai, Noida, Navi Mumbai, Kolkata, Pune, Chennai, and Ahmedabad. Its partnership with Mahindra and Ford enabled Zoomcar to be the first to offer electric vehicles in India. It has partnered with several companies like Uber for programs like RideSmartBLR to encourage car rentals for its economic and environmental benefits. The company has several unique offerings for their target audience – individuals that don’t own cars. With the keyless entry system, customers can unlock cars through an app and be picked up and dropped off to their destination. Zoomcar has been funded from several individual investors as well as Ford Motor Company, Sequoia Capital, Athene Capital and others. The company’s biggest competition is from companies like Drivezy and MylesCars, which is operated by CarsOnRent.